In addition to my work with life and corporate coaching, I am a passionate amateur triathlete. 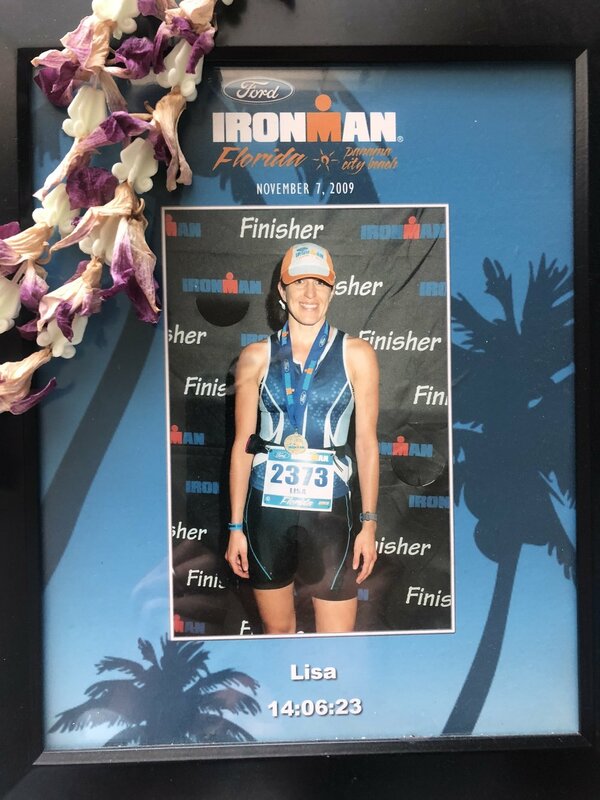 I am working to obtain my coaching certification to begin coaching triathletes, especially folks new to the sport or those looking to participate in their first Ironman race. As someone who has spent the better part of 13 years racing and experiencing triathlon, I am a huge advocate for the benefits of the training and “racing”, if this is something that calls to you. Recently I had an exchange with a relative stranger at a company I was visiting for a full-day workshop that challenged my self-definition and left me on the precipice of diving head-long into a shame spiral. We were all milling around in a conference room and one of the employees walked over and introduced himself. I did the same and we started making small talk. “I thought you were a triathlete?” this man said to me. “I am, I said. I’m an Ironman.” My voice was tinged with pride as that is no small accomplishment. This is a large part of my self-worth and values. Crossing that finish line at Ironman Florida is something I will never forget and provides daily motivation. “You don’t look a triathlete,” he said, his voice echoing across the conference room, which was filling up with folks. Yep. That’s what this man said to me. He scanned my body and told me that I didn’t fit his vision of what a female triathlete should look like and felt compelled to share that with me. There was an awkward pause in the conversations going around me. I felt that the eyes of the entire room were scanning my body, trying to figure out if they agreed with his opinion or not (this was probably NOT happening, by the way, in reality…more on this later). So what type of storytelling happened for me in those brief moments? Honestly, my first reaction was to agree with this guy. I don’t look like the pictures you see of professional female triathletes in magazines or social media. Not that long ago, I would have tried to counterbalance my shame in the moment by tearing into this person, verbally eviscerating him, leaving no doubt that I thought he was rude, ignorant, FAT, and dozens of other horrible things that probably would have jeopardized my reputation among my team members and within the client team. I didn’t do that, but I wanted to – the desire to punch back and shame him like he’d shamed me was very strong. I’m not going to tell you that I smiled calmly and let his words pass over my aura untouched – I’m not THAT enlightened and beatific. Instead, I let a few seconds pass in silence and asked him: “What does a triathlete look like then?”, admittedly with an edge to my voice. He stammered out an apology, made a comment about wanting to get some coffee, fled the room, and the conversations around us sparked up again. The moment had passed without emotional or social bloodshed on either side. But it left a mark. What I choose to take from this incident - with the benefit of hindsight - is that my reaction to his obtuse comment was completely under my control. In the spirit of the movie Inside Out, I could choose which part of my personality to lead with: joy, fear, anger, sadness, or disgust. Did he mean to shame me? I don’t know. Was he telling himself a story about not being good enough because here was this person ‘bragging’ about running triathlons? I don’t know. Was his view of the world filtered through his specific len(s) about self-worth? Yes, absolutely. The incredible Brené Brown shares in her books that only those in the ‘arena’ with us – those embracing vulnerability – should be listened to, in terms of feedback. Those critics sitting outside the arena freely offer their criticism, but it should hold less weight for us, given that these folks are not willing to face their fears, join in on the rumbling, and risk getting knocked down. Was this man in the arena? From my perspective, no. What would have happened if I’d taken his criticism to heart, let it influence the way I viewed myself and my body? I might have cashed my ticket for the shame spiral rollercoaster…telling myself, “He’s right. I’m fat. I’m out of shape. I’m a fraud.” In one moment, I would have discounted all of my hard work, my self-worth, and my ability to face these huge challenges, all in one go. What a huge loss. How many of us, especially when we’re tired or feeling vulnerable, let these types of comments alter our self-image? What examples can you think of from your life? How can you break the cycle of shame when these situations arise? Thanks so much for reading! Until next time, keep living your best life!